Air Optix Aqua Multifocal contact lenses have been one of the better multifocal contact lenses on the market for the past few years. 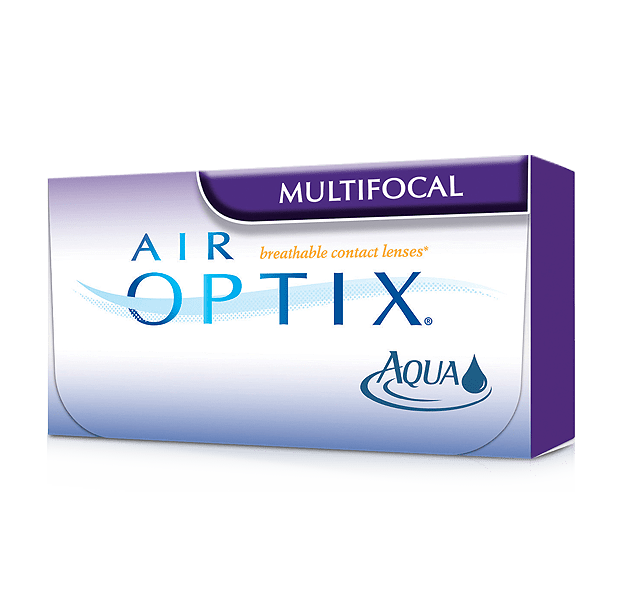 Air Optix Aqua Multifocal contact lenses is available in a variety of near powers in addition to your distance correction, so we’ll be able to give your near vision just the boost it needs. Most people will prefer progressive eyeglasses or reading glasses for extended near work, but for being able to live an active life and switch from near to far without glasses, it’s hard to beat multifocal contact lenses. The Air Optix Aqua Multifocal contact lenses have different areas of the lens that correspond to different powers. The center of the lens is a near zone for up-close vision. The next zone is a ring shaped zone that surrounds the center-near zone and allows for intermediate vision such as when reading a computer screen that is a little farther away than where a book generally is held. The outer ring shaped zone is for distance vision. This outer ring will contain your distance prescription to enable you to see clearly in the distance. By manipulating the optics of the lens, additional near power is created by the manufacturer in the inner intermediate and near zones. You can purchase Air Optix Aqua Multifocal contact lenses from our office with just a phone call. If your last contact lens exam was with us, we’ll have your prescription on file for you, so there’ll be nothing you have to do other than give us a call and let us know how many boxes you’d like. If it has been more than a year since your last contact lens exam, you will need a new eye exam and CL fitting or evaluation to ensure that Air Optix Aqua Multifocal contact lenses are still the best choice for your ocular health and vision. You can schedule your contact lens exam online or call our office with any questions.